The H.B. 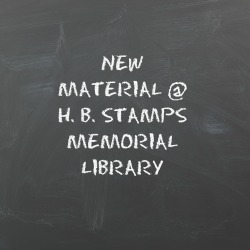 Stamps Memorial Library was the first substantive library in the city of Rogersville. Previous to the opening of the H.B. Stamps Memorial Library, the first library in Rogersville was organized in the month of July 1941. In 1975, the H.B. Stamps Library Board and the Hawkins County Library Board merged and purchased land for a new library. 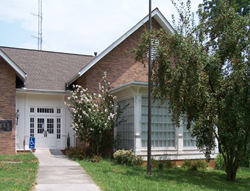 The purchase of the Kenner property located at 407 East Main Street was successful and a grant for $54,000 was received for the building of a new library and community center. The new H.B. Stamps Memorial Library was opened on November 9, 1980. The library houses over 25,000 items including books, magazines, audio books, DVDs, and videos as well as 9 public access computers. 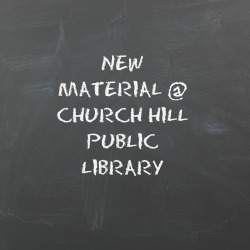 The library also offers copier and fax services along with interlibrary loans, children programs, and an adult book group. We also offer Notary Service. Contact the library for times when the Notary is available. The Library is located on the corners of Main Street and Clay Street in Downtown Rogersville, TN.